The Talmud says: “If someone comes to kill you, rise up and kill him first.” This instinct to take every measure, even the most aggressive, to defend the Jewish people is hardwired into Israel’s DNA. From the very beginning of its statehood in 1948, protecting the nation from harm has been the responsibility of its intelligence community and armed services, and there is one weapon in their vast arsenal that they have relied upon to thwart the most serious threats: Targeted assassinations have been used countless times, on enemies large and small, sometimes in response to attacks against the Israeli people and sometimes preemptively. In this page-turning, eye-opening book, journalist and military analyst Ronen Bergman—praised by David Remnick as “arguably [Israel’s] best investigative reporter”—offers a riveting inside account of the targeted killing programs: their successes, their failures, and the moral and political price exacted on the men and women who approved and carried out the missions. 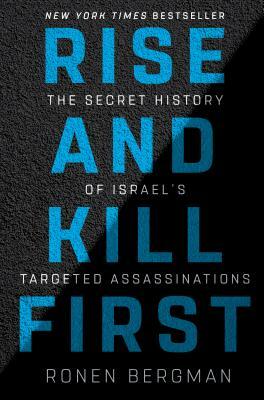 Including never-before-reported, behind-the-curtain accounts of key operations, and based on hundreds of on-the-record interviews and thousands of files to which Bergman has gotten exclusive access over his decades of reporting, Rise and Kill First brings us deep into the heart of Israel’s most secret activities. Bergman traces, from statehood to the present, the gripping events and thorny ethical questions underlying Israel’s targeted killing campaign, which has shaped the Israeli nation, the Middle East, and the entire world. Ronen Bergman is the senior correspondent for military and intelligence affairs for Yedioth Ahronoth, Israel’s largest daily paid newspaper, and a contributing writer for The New York Times Magazine, where he reports on intelligence, national security, terrorism, and nuclear issues. Bergman is the author of five bestselling Hebrew-language nonfiction books and The Secret War with Iran, which was published in the United States by Free Press. Bergman is the recipient of the Sokolow Prize, Israel’s most esteemed award for journalism, and the B’nai B’rith International Press Award, among other honors. A member of the Israeli bar, he graduated with honors from the University of Haifa Faculty of Law and clerked in the attorney general’s office. A winner of a Chevening Scholarship from the British Foreign Office, he received a master’s in international relations from Cambridge University, where he was also awarded his PhD in history.